October 6, 2016: The fall quarter newsletter was sent to subscribers a couple of days ago. It's available here in case you missed it. Here's significant news that did not make the newsletter: The free "starter" version of Delphi has been extended by Embarcadero!. Thanks to viewer Mac for the heads up with the info. This is the first free release that I recall since Turbo Pascal became "abandonware" in 2002 and, according to Wikipedia, an Explorer version in 2005. I wasn't excited about these because they did not include the compiler source code which was (and is) a valuable learning resource. The new free release is at Delphi 10.1 Berlin Starter Edition and still has the "no commercial use" restriction but does include the source code! Mac also says that it is only available in the 32 bit version which is fine for most users, including me. They do say "Offer may be withdrawn at any time", so don't delay if you want to check it out. October 15, 2016: EasyCGI, the host site for DFF, has modified something in their structure which is causing problems with accessing this website. It is erroneously asking for authentication (Username and Password) when browsing to a page. The problem seems worse with Internet Explorer and frequently goes away if you just click the "Cancel" button in the popup window several times. There may be a similar problem when attempting to download program executables or source code zip files. Google Chrome seems to work more often than Internet Explorer or Edge. All browsers seem to be missing embedded pictures on pages, at least in Windows 10. I'm going over now to check the situation on other computers to check Windows 7 and 8.1. I'll post again here as things develop or problem gets resolved . October 21, 2016: Although I never learned the root cause of the authentication problem with the website, it seems only to have affected files uploaded during a period of two of three days around the 15th. Most files I could repair by deleting and re-uploading pictures or page data. A couple required intervention by EasyCGI support. If you have trouble accessing pages or files on this website, please let me know. Two programs were updated today based on today's Mensa Calendar puzzle asking for 3 and 6 letter synonyms using all 9 letters in the word CARPOOLED. My Unscramble program is part of my favorite word puzzle solver collection, Wordstuff3, and should have been able to solve it, but did not. It turns out that the three letter synonym is PRO which our dictionary categorizes as an abbreviation which are not searched by default. Whether it is may be debated, but Unscramble had a hard-to-find option to include abbreviations which led me to cheat and peek at the answer. Selecting non-standard words like abbreviations is now much simpler with Unscamble V2, In the process of researching the problem, I also corrected some text scaling problems in the DicMaint dictionary maintenance program which allows words to be categorized as Abbreviation, Capitalized, or Foreign words as well as performing other maintenance tasks. 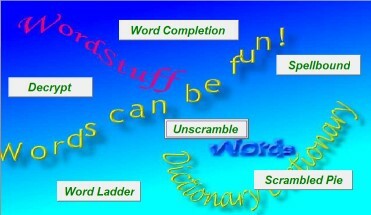 Downloads for both can be found on the WordStuff3 package description page. October 24, 2016: A viewer reported today that our CPU Speed demo program is being flagged as a virus or malware by some systems (including mine when I checked). The timestamps and size on the site match my local version, so I'm quite sure that it is a false positive for the imported item. I've left the source download in place but removed the executable download link. The source can be recompiled and run locally with no problems. Non-Delphians will have to find another source. Increased security rarely makes everyday operations easier, but it is the price we pay to avoid the catastrophic. October 30, 2016: What does it take to be a good problem solver? It's a question that has interested me for years, primarily because the world needs more of us J. Farmers, detectives, mechanics, doctors, scientists, artists, and programmers are just some of the occupations where success is closely related to problem solving skills. I'm sure of some of the common characteristics (fact gathering, planning, divide & conquer, persistence), but there must be others. I should add "welcoming constructive criticism" to the list. I find it difficult to think about problem solving while doing the problem solving. Today's program, Grid Subdivisions, is a first attempt at documenting my processes, for programmers at least.